Steve has served as the Academy's Executive Director since its' genesis. He has overseen the establishment and growth of the programming and services the Academy has developed and delivered. 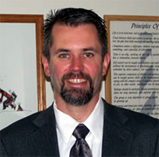 Steve has served on numerous state and regional committees designed to improve services for families and children. He is a lifelong resident of West Virginia and a graduate of North Marion High School. Steve earned a Bachelor of Arts degree from Fairmont State University and a Master of Social Work degree from West Virginia University. He has served as an adjunct faculty member at FSU. Steve has worked as a Regional Director, Director of Quality Assurance and Utilization Management, Clinical Team Leader, Program Supervisor and Family Service Coordinator for other agencies in West Virginia. Steve is blindly loyal to and, a defender of the faith, regarding WVU football.